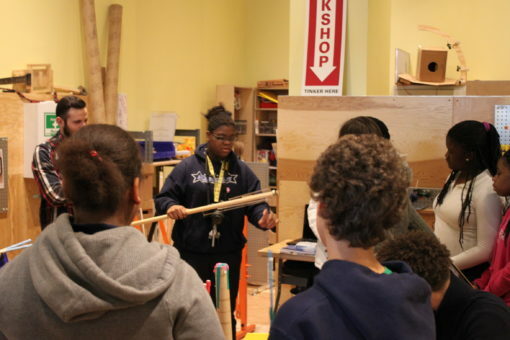 The students from the Museum’s afterschool program, YouthALIVE!, visited MAKESHOP a couple of weeks ago to work on a build challenge. They spent three days trying to design and build something that made noise. As always, it is a fun experience to work with this group of kids. They created some amazing and inventive projects over the course of the three days. Some students started with one idea and discovered that it didn’t quite work. You can never predict what will happen unless you try it. We consider failure to be an important part of the learning process, so we celebrate it when it happens and then try again! There were drums, shakers, guitars, and many other musical inventions created during this three day session. On the last da,y we let each student demonstrate and talk about his/her instrument. We even had them vote on which instrument they thought was the most creative.